The City of Sonoma’s 2015-2123 Housing Element is the guiding long-range planning document for housing-related policies in Sonoma. State law recognizes the role local governments play in the availability, adequacy and affordability of housing, and requires them to adopt a Housing Element as one of the seven mandated elements of the General Plan. Housing Element law mandates that local governments adequately plan to meet the existing and projected housing needs of all economic segments of the community. The law recognizes that in order for the private market to adequately address housing needs and demand, local governments must adopt land use plans and regulatory systems that provide opportunities for, and do not unduly constrain housing production. To learn more about the City's efforts to increase housing opportunities, visit our Key Initiative page on housing strategies. A technical background report consisting of a detailed housing needs assessment, an analysis of constraints to housing production and affordability, and an evaluation of the City’s progress in implementing the housing programs established in the previous Housing Element. Inclusionary Requirements: Residential developments containing five or more parcels or units must provide that at least 20 percent of the total parcels or units are affordable to households in the low and moderate income categories. 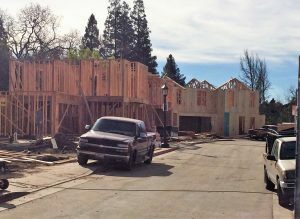 Density Bonuses: As required by state law, a qualifying residential development project is entitled to a density bonus (the ability to construct more residential dwelling units than normally allowed) and other incentives. For more information on inclusionary requirements and density bonuses, contact Planning Department staff.